Police have blamed speed for the horrific Rusape bus accident which claimed 50 people and left more than 80 others injured. One of the drivers involved in the crash survived the accident and is reportedly on the run. The accident which involving Bolt Cutter and Smart Express buses occurred Wednesday evening just before the Rusape toll gate along the Harare-Mutare Highway. According to ZRP national spokesperson Charity Charamba, the Smart Express driver tried to overtake at a prohibited zone. 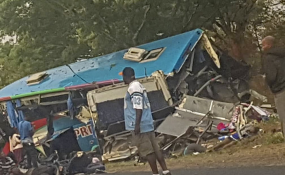 "Preliminary investigations carried out by police indicate that the driver of Smart Express bus who was coming from Mutare overtook a haulage truck and a Toyota Wish vehicle at a prohibited zone. "While overtaking, the driver saw an oncoming bus and tried to return to his lane but failed. "In a bid to avoid a head-on collision, he swerved off the road to the extreme right, hit the Bolt Cutter bus on the left side. "Both buses were extensively damaged which resulted in the killing and injuring of passengers," said Charamba. said they were looking for the Smart Express driver who is reportedly on the run after surviving the crash. Government has since declared the accident a national disaster.